The Hallucinatory themes of my recent series have developed from questions of painterly surface. The surfaces are heavily marbled and fluid and the paintings are largely improvised. The marbled surface seems to me to be a reoccurring motif that appears in various guises at particular points in history. Its morphic language belongs to the phantasmagoria of the Romantic period, and also the LSD culture of free love of the late 1960’s and the UFO club. I see the marbled surface as a signifier; in its convulsive movement I explore the anxieties of the individual spirit, rebelliousness and the subconscious. I also look at the cult of the young dead poet. Youth, beauty and genius cut off before full bloom is a tragic ideal. I find images of decadentism and decay alluring, and in my paintings, the central protagonist is often given over to this luxurious despair. Out of this decadentism comes my interest in Laudanum; particularly the Romantic poets and Wilkie Collins dependency on the opiate and their experiences of being wracked with hallucinations. I think it is poetic that Laudanum it is primarily a painkiller and this decadentism is derived from an alleviation of suffering. In its cure is a kind of beauty. I also draw influences from Victorian Fairy Painting. There is a grotesque quality to the over-abundant and over-populated works of Joseph Noel Paton, and in the paintings of John Anster Fitzgerald. This style of painting developed out of thinly constructed rationalism that might at any point collapse. My paintings belong to that moment of collapse. They are overwrought projections of psychological disturbance and the psychedelia. After huge consumptions of Laudanum, Wikie Collins became haunted by an apparition of his double, “Ghost Wilkie”. 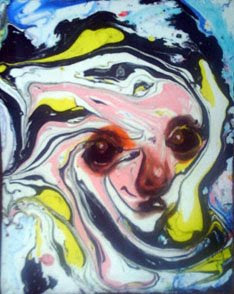 I’m interested in “Ghost Wilkie” because I think that my paintings are like this apparition. My paintings have an awkward and nostalgic view of the Romantic period. They re-enact, but in doing so, become something else. I don’t see my practice as parodic; instead I feel it has more in common with “Ghost Wilkie”. The work becomes a Doppelganger. In this instance, the Doppelganger emerges from images of fervent passions, but is transformed into a double, aping and re-enacting that passion until the memory is consumed. My work, through the act of doubling, mocks the torturous moment whilst seeking to inhabit it.